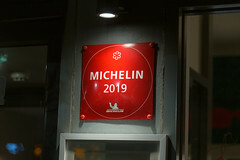 The particular reason it is hard to get into is that while A. Wong has been on our hit list for several years, we’re not the only ones keeping an eye on it: In 2018 they got a Michelin Star. That’s why it’s hard to get reservations, since most everyone going there in the evening is trying to get a booking for their Tastes of China prix fixe menu with an impressive 14 courses for 95 quid. It also takes almost 3 hours, so it ties up a lot of the tables. I would have loved that experience, but we were able to score a 1:45 long “a la carte” reservation, with access to most of that evening’s offerings. 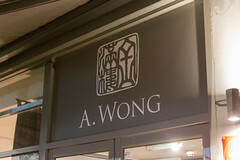 In line with it’s Michelin Star, stepping into A. Wong you can immediately tell that they are service-oriented: it’s a neat, attractive space with well-appointed, and reasonably spacious tables (unlike many London places where I feel like I’m crammed into a cafe with one too many tables). In addition to their dining room upstairs, they also run a cocktail lounge, The Forbidden City, that offers the same cocktails as A. Wong and a nice selection of small plates (although the word is out, getting reservations to The Forbidden City is almost as hard as A. Wong itself). Speaking of cocktails… It seems that fancy cocktails are one of the current culinary trends, and A. Wong is doing a good job of having an interesting cocktail list that complements their overall menu. 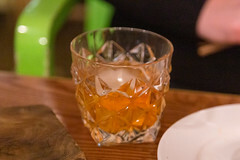 In Carol’s case, she opted for their “Peking Duck” Old Fashioned: ice filtrated bourbon infused with traditional Peking duck fat and roasting spices, sugar syrup, and Angostura bitters. It sounds odd with the duck fat, but it actually worked quite well: the duck fat added a nice mouthfeel and a mild duck flavor that combined well with the smoky bourbon and the spicy notes of the cocktail. 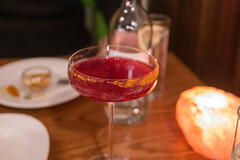 Myself, I opted for the Xinjiang, a gin-based cocktail with A Wong’s house gin, a pomegranate granita including whole pomegranate seeds, preserved plum, ginger, and cumin. Served up as a coupe of granita over which the rest of the cocktail is poured as they serve it, it was a surprisingly well-composed and refreshing cocktail. 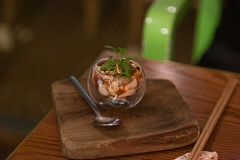 Starting off with our appetizers, the first to arrive was barbecued crispy pork belly with candied pork jerky. 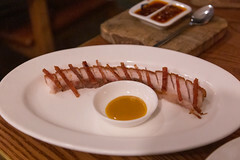 Pork belly is often a novelty, but here it was cooked to absolute perfection, with crispy laminate layers connected by tender and flavorful fat. Neither too firm nor falling apart, with just a bit of crunch from the jerky, this was a textural and flavor masterpiece. Our next appetizer, the Chengdu street tofu with soy chilli, peanuts, preserved vegetables was pleasant dish and a very interesting contrast to the pork belly. The tofu was extremely soft and pillowy, almost a custard, with a nice heat note from the soy chilli, a tang from the preserved vegetables, and a light crunch from the peanuts. The final result of the combination was one of the most deliciously subtle and sublime dishes I’ve had recently. Moving on to the main courses, the first one up was Moo Shu Pork. Long a staple of American Chinese food, it was interesting seeing this done by a really competent chef: every little detail in this dish worked well. The pancakes themselves were nicely executed, nearly-translucent thin flour (báo bǐng). The filling was a really nice mix of stir-fried pork tenderloin, scallion, radish, beans, and wood ear mushrooms, served up with a pleasant house-made hoisin. The resulting dish particularly showcased the earthier flavors of the pork and mushroom (as opposed to the American Chinese rendition, which primarily presents as an “open-faced egg roll”), and serving it up with a thin crispy crepe of egg added a really nice textural element as well. Finally, a slight bit of spicy heat from the hoisin tied this all together into a feast of texture and taste. 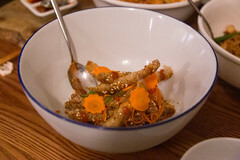 Next up was their crispy chilli-caramelised beef and pickled carrots. These were a basically thin strips of a very flavorful and heavily chilli-marinated beef breaded and deep-fried to meticulous perfection. Mixed with some tangy pickled carrots, and served up up with a side order of Singapore noodles (themselves a flavorful mix of rice vermicelli, veggies, ham, and curry spices), and this was a delicious, crispy, and surprisingly spicy dish, but composed such that you could still clearly taste both the beef and the carrot. 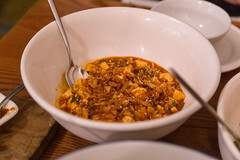 Then, we shifted gears with some ma po tofu with crispy onions and coriander. Long a favorite of mine, I always enjoy a good ma po tofu as a combination of texture, mild heat, and rich umami from the sauce. 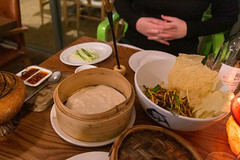 A. Wong’s rendition was masterful: the tofu itself had almost the same sublime texture as the Chengdu tofu appetizer, combined with a rich, spicy, and tangy sauce with bits of pepper in it that gave the dish a nice, spicy bite. Adding to the textural dimension where the perfectly crisped onion bits, and the coriander, both of which gave two different styles of “crunch” to the dish, and the latter adding a nice herbal note. This was one of the most deliciously sublime and texturally perfect dishes I’ve had in a while. 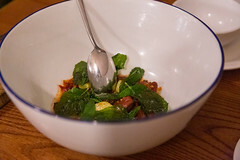 Our final appetizer was another beef dish: ‘Dai’ seared Wagyu beef with mint, chilli and lemongrass. Here, the star was the seared Wagyu: tender, extremely flavorful, and rare beef seared to a perfect crisp; again, a nice combination of flavor and texture. The mint, chilli, and lemongrass marinate did a really nice job of complementing the flavor of the beef without covering it up, and providing a really great combination of heat (chilli), cool herbal (mint), and tangy (lemongrass) notes. One mark of a great restaurant is that by the end of this meal I was feeling simultaneously satisfied and wanting. “Satisfied” in that the meal was a true masterpiece of both flavor and texture, each dish basically a perfectly executed version of an otherwise familiar Chinese dish, showcasing some top ingredients and technique. “Wanting”, in that I really found myself wanting to return another time. 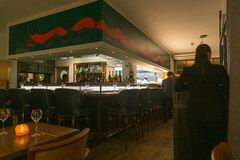 Looking at some of the other reviews out there, the normally curmudgeonly Jay Rayner has an excellent review of their dim sum, and several other reviews that show that the Tastes of China menu is worth the price tag (95 quid) and time (almost 3 hours) involved, plus the difficulty of scoring the reservation. I’m definitely planning on at least one revisit in the future. Meanwhile, especially for the cost, our a la carte dinner still showcased A. Wong’s Michelin-caliber cuisine and left us thoroughly pleased.